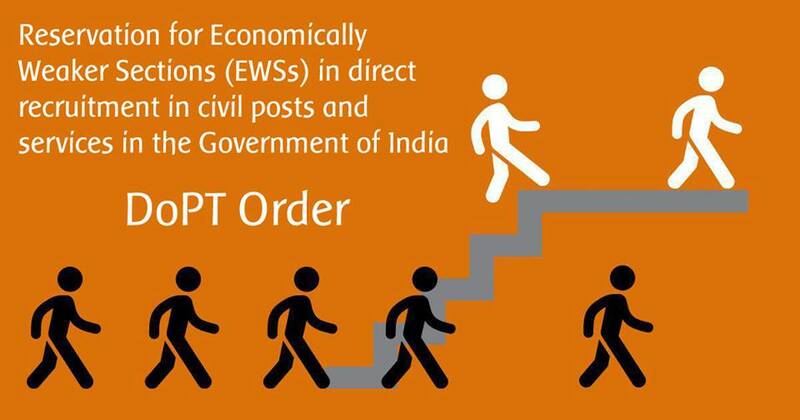 In continuation of this Department’s Office Memorandum of even number dated 19.01.2019, the following instructions are issued in consultation ‘with’ Ministry of Social Justice and Empowerment and Department of Legal Affairs regarding reservation for EWSs not covered under the reservation scheme for SCs/STs/OBCs in respect of direct recruitment in civil posts and services in the Government of India. incumbents of which have to use that knowledge in the discharge of their duties. (iii) The posts should be ‘for conducting research’ or for organizing, guiding and directing research’. 4.1 Persons who are not covered under the scheme of reservation for SCs, STs and OBCs and whose family has gross annual income below Rs 800 lakh (Rupees eight lakh only) are to be identified as EWSs for benefit of reservation. Income shall also include income from all sources i.e. salary, agriculture, business, profession, etc. for the financial year prior to the year of application. iv. Residential, plot of 200 sq. yards and above in areas other than the notified municipalities. The Ministries/Departments shall send single consolidated fortnightly report including their attached/subordinate offices beginning from 15.2.2019 as per format at Annexure-VI -. 9.1 Every Government establishment shall appoint a senior officer of the Department as the Grievance Redressal Officer. the website and in the office of the concerned establishment. 12. All the Ministries/Departments are requested to bring the above instructions to the notice of all appointing authorities, under their control. In case of any difficulty with regard to implementation of the provisions of this OM, the concerned authorities may consult DOP&T through their administrative Ministry/Department. Dopt orders 2013 : Ad-hoc appointment carrying on in the grade of Assistant of CSS-regarding.